Digital art has come so far, but I personally miss the simplicity of pixel art. Maybe it comes from the nostalgia of playing early video games, and having that connection to the past. I always enjoyed the mosaic feeling of creating art, pixel by pixel. It was fun because our screens only had a resolution of 800 x 600 pixels at that time. Pixel sprites now look like ants on newer screens! Sprites, oh how I loved these. Here’s a terrible but very timely example of a website full of animated sprites. They were SO cute. I learned how to do basic animation because of them. There is a lot of power in a little pixel. I also remember when pixel fonts were a thing, and created many websites with them. I’d create layouts with intricate pixel designs, making sure all the shading was correct, but still using very limited colours. It was a challenge I forever enjoyed. Years later (and now over 10 years ago! ), I got to revisit my love for pixel art at uni. I created the artwork as a large fold-out poster, visually depicting the song “O Superman” by Laurie Anderson (read the lyrics here and the image will make more sense). I stumbled across this recently, and reminisced of my time creating pixel art. I’m not sure if it will ever make a resurgence, but it would be lovely to see it in the future, if it does. 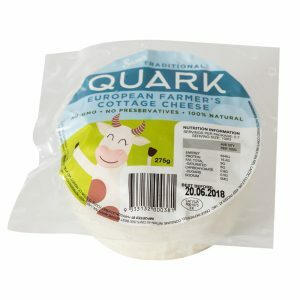 We get quite a few unique requests for projects, that aren’t quite our usual corporate/business type. 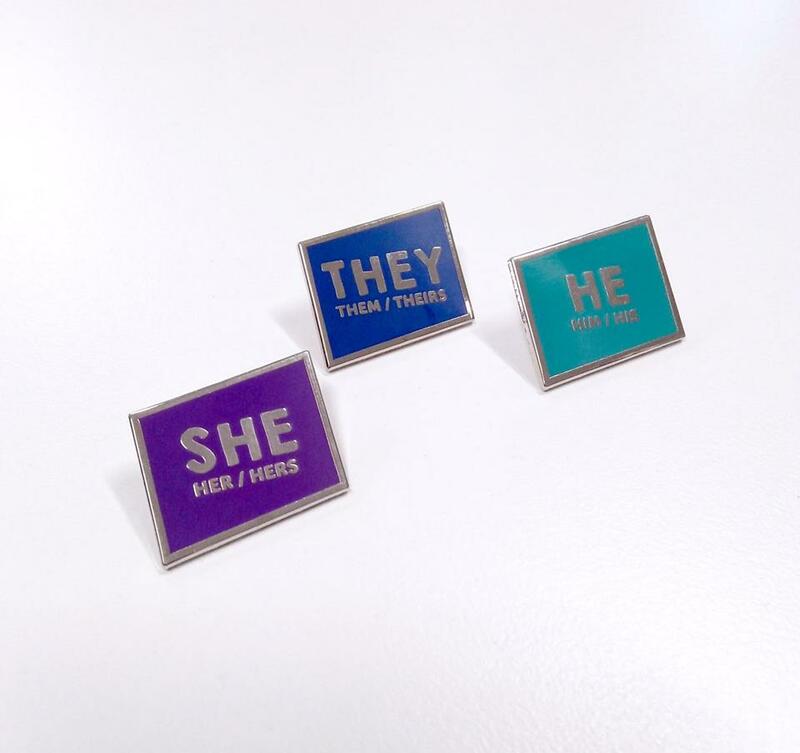 The pronoun pins for A Gender Agenda fall into this realm. ensure there was no gender stereotyping, ie. no blue for “he”. We had free reign on the shape, and tried a number of designs. The parallelogram came out as the winner. The pins became so popular that we were requested to build an online order form for them. The first batch sold out within a few weeks! Music, journalism and design seem very different. But in reality, they all share one common factor: they are the storytellers of our world. Music shares stories through sound and words. Journalism shares stories through text and voice. Design shares stories through images. They each have their unique ways of telling a story, and all have their merit. What communicates to each of us is different – some people will connect better with music sending a message, whilst someone else may recognise and connect to a poster. The journey I took to realise this has been a long one – it’s my lifetime story in itself. As my teens went by, I looked at journalism as a whole – no longer just within the music industry. I realised that what I loved was getting to share people’s stories, through interviewing and presenting. Especially people and stories within Australia, for Australians. My work experience was shared between a printers and a music magazine, so I could cover all three bases (design, journalism and the music industry). When I completed high school, my two top preferences for university were communication design and then journalism. I chose communication design…or did it choose me? Years later, after I graduated, I realised that I found my calling. I was in the right place all along, doing what I dreamed of. I am sharing stories of people in Australia, visually, through design. And yes, I have even been able to design some CD covers in my career. What should you take from this? Storytelling is in everything we do. There are many ways to share information. It can be shared through music, through journalism, through design. Different methods reach out to different people. My ability to share stories through design holds a special place in my heart. I am getting to share people’s dreams and passions with my visual skills. And I feel so honoured that clients choose us to help them share their stories. In food packaging design, products are sometimes sold in various sizes. Compared to clothing where the size can simply be changed on the tag, packaging design is a little more extensive. In packaging design, the size of the contents defines the outside packaging shape and size. Sometimes this can be a change between a box and a bag. Other times, it’s just a range of the same boxes/bags in different sizes. 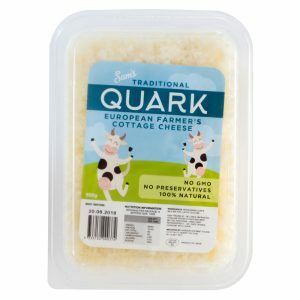 In this example we designed, Sam’s Quark comes in 275g and 600g. One is a shrink-wrap packet containing round cheese, the other is a container with a rectangle block of cheese. The design had to include the same amount of information, even though the space is far more limited in a circle. Working within a circle has its challenges, such as making a barcode look like it belongs, and aligning tables within the space. We actually enjoy the challenge; just a bit of visual problem solving! One thing I love seeing is the opportunity kids have today: we have come so far with coding over the past 20 years. When I was growing up (see my previous post), it was up to me to do my own learning. I could only learn what I found in my own free time, as it wasn’t a focus at school. Now there are coding clubs run across Australia, teaching kids how to use code in all sorts of ways. Not just webdesign, but game design, animation, program design and more. Why do I think kids learning code is so important? Coding is all about problem solving. You might be creating a website to share information, or developing a game to teach people a new skill. But the problem solving runs deeper. When coding, sometimes things don’t work as expected. You learn so much through testing and redeveloping. Even just working through some code to find an error, and learning the most efficient way to analyse the code. Problem solving teaches kids to be detail oriented, patient and be able to think on their feet. And if they’re learning it while they are having fun, then they usually won’t feel like they are learning (in a good way). Coding also gives a lot of kids a new space for creativity. Not every kid is set to become an artist, but there are many more ways to be creative – and coding opens up a whole world for it. Coding gives the framework to create new inventions, new ways of presenting information, new ways of interacting. And when it’s kids at the helm, there are no limits. I am really looking forward to the future, and what the next generations create with code. 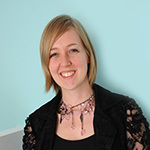 A personal post today: how did I get into webdesign? I grew up in a house without a computer. We didn’t get a computer until I was in year 9, when the school I attended required students to type their essays instead of handwriting them. However, I had already been going to the local internet cafe every day after school, making the most of my hour on the net. We are in the year 2000, by the way. During that hour each day, I found Yahoo groups. I soon realised these could be customised with colours and your own images. I worked out what HTML colours meant and got customising. As soon as I had my own computer at home, I started using Jasc Paint Shop Pro (memories!) and designing my own banners. Terrible now, but it was the beginning of my career and I had no idea. Yahoo Groups were boring. I wanted to do more. I idolised fan websites of my favourite TV shows and bands, and wished I could be as creative as that. I wanted to learn to create what they had created. I wanted to do MORE than what they were doing. I had to learn HTML. There was no turning back. By now, I was fully capable of editing photos, creating unique layout designs, making pixel art. I learned so much about colour schemes and typography during this time, too. So I kept creating. I kept coding. I kept building new websites as often as I could. I tried out designing Flash websites, and while that was also fun – I’m grateful it wasn’t to be forever. I loved solid code. Fast forward a few years later, we had started to move away from tables and into div layers. Oh how excited I was (#nerdtalk). The possibilities were opening up. And then there were content management systems. I had dabbled in ASP early on while managing a few existing websites…but then there was PHP. And how I fell in love with the possibilities. It changed everything about webdesign: no longer would a website need to be static or fully managed by someone who knows code. A website could be custom designed, and someone else with basic editing skills could maintain the content. This was the biggest turning point. From there, coding and learning and developing continued. By the time I graduated university, I already had many paid webdesign projects – I don’t remember how it happened, but it snowballed and became a big part of my work. 11 years later, and webdesign is now a major portion of our studio. I am still constantly learning new code, and designing websites for our clients is just as much of a joy now as it was all the way back in the beginning. You know, I didn’t even realise what I was doing was “designing” when I was 15. I was just having fun! When I was growing up, I found design inspiration in all sorts of odd places. Two of my favourites were postage stamps and transport tickets. Similar to stamps, it’s a small area to make a big impact with. 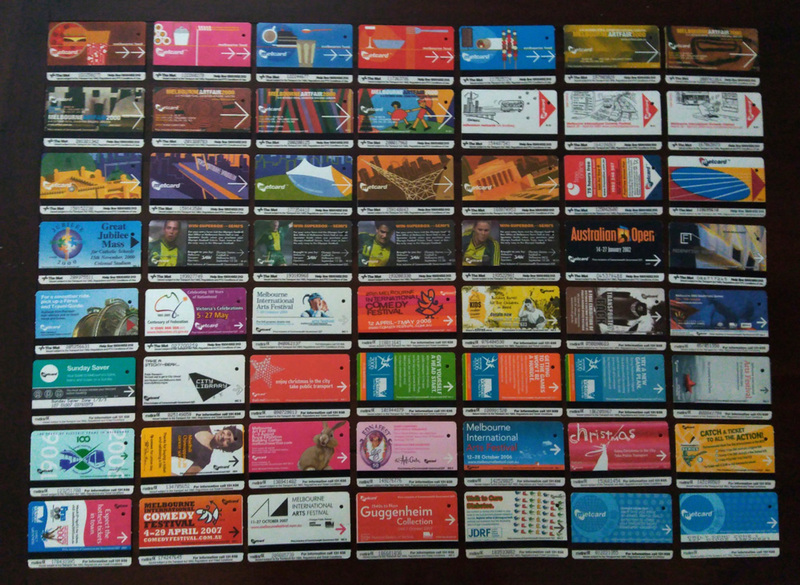 But with Metcards, it was often a card that someone would need to hold onto for a week, or a month. I loved the idea that you could create something for someone to glance at every day. That you could make something that would make someone read, someone smile, someone stop for a moment of their day. I always dreamed of getting to design my own ticket, someday. While that didn’t happen (we now have boring credit-card style PTV cards, all with the same design! ), it was a good motivator throughout high school and beyond. It reminded me that design is everywhere. And no how big or small the design is, it always has a reason to be there. This is a paper I wrote quite a long time ago on graffiti with purpose, but I have never published it. Enjoy! Design is all around us, even where we least expect it. Almost everything in our environment is designed in some way, shape or form – whether it is billboards and buildings, or even garden layouts and graffiti. Contrary to popular opinion, graffiti is its own art form. Although graffiti is often done in illegal places (such as laneways, train lines, walls of buildings), much thought is put into the design of detailed work. A misunderstood form of art and design, “graffiti” is derived from the Italian graffio – meaning “to scratch/scribble on a surface”. Graffiti is a colourful art form, promoting the artist’s beliefs, opinions, and interests to their sub-culture peers and the public. However, graffiti isn’t always illegal, and can be used to help the surrounds. Walls are often commissioned to graffiti artists to put their talent to accepted use within a community. When a high-quality graffiti artwork has been produced for the public to see, other graffiti artists will often respect the work and not paint over it. And because it is a clean and related mural, the surrounding environment isn’t degraded from poor graffiti that lowers the value of the suburb or city. But not all graffiti is done as a “pretty picture”. Some graffiti is highly political, such as the message “No jobs on a dead planet” boldly painted onto an industrial chimney in West Melbourne. The Greens Party were the instigators of this large-scale message, specifically painted onto the chimney, relating it to the pollution the chimney once emitted – giving the message immediate meaning and recognition. However, it is also placed on that particular chimney, as it is in a prime position for many people to see it. The message is painted in white, to contrast against the brown chimney for optimum exposure. If the message was printed in black, or even another colour such as blue or green, it would not be as visible as it is in white. However, white is also the colour of peace, implying the message is an appeal to the community, an advertisement for awareness. This is further reiterated with the use of the peace symbol at the end of the message. And then there is stereotype graffiti, typically found in laneways and along train lines – places that aren’t policed 24-7. Stereotypical graffiti is often colourful, done in spray paint, and is a name or a word in an extremely freeform style of typography, presenting the public with an artwork made up of letters more than letters made into an artwork. This piece is painted onto a roller-door of a shop in the tiny Degraves St – a shop that isn’t even open on a Sunday, clearly being susceptible to graffiti. An interesting choice of location, however, as the outer edge of the shop “frames” the work, as if it was a painting in an art gallery. However, the tin would have been an issue to paint on, with the curves affecting the angles of lines and paint coverage. This piece holds some “fashionable” aspects of graffiti from the present, being the use of clouds and sparkles behind the typography. It gives a dreamy feeling, assisted by the highlights with white and the use of the colour blue. The word used in the graffiti could be the artist’s alias, a word of meaning, or a bunch of letters meaning nothing (but look nice when put together). According to the publication Spraycan Art, Australian graffiti artists are known for using random, useless words in their works – whereas overseas in places such as New York, the words used in their graffiti are often the artists’ names, trying to outdo each other with the most well-constructed and artistic piece possible. But when you look a little further into the graffiti of Melbourne, specifically into the laneway Centre Place – famous for its unique and sophisticated graffiti – quotes scatter the walls in obscure but deliberate places. They are specifically there for others to read and gain knowledge from, such as “before one acts, one should ask one self, ‘what would happen if all others were doing as I am doing?’” (pictured). This is placed on the dumpster near some crates – the access point to climb to do graffiti on the highest sections of the laneway. This means their intended audience would see the message on their way to doing graffiti in the laneway, and as it is in a place where a person would have to stop to climb, chances are they would stop and read the philosophy of graffiti. A quick scribble in permanent marker turns into a timely thought-provoking philosophy for everyone who sees it. Then in the same laneway, part of the back wall is commissioned art space: the “Citylights” project. Created in 1996, the four illuminated light boxes have been host to many street artists, giving them a new medium to work with, and a new space of “legal” wall to display their work on. Some of the art presented has been rather political, and has been well-known for causing controversy – such as Regan Smith’s Citylights display “Crime Walls”. This edginess is typical of graffiti artists, publicizing the tougher side of life that many of the public tend to ignore. This piece was of the Melbourne underworld figures George Williams, Mario Condello and Dominic Gatto – including one panel which had the “I ♥ NY” logo with “Melbourne” replacing the scribbled-out NY. Many people in Melbourne walk through Degraves St daily, and directly go past Central Place and see the Citylights project. It stands out in the darkened (but short) laneway, being lit all day and night. The boxes are made of metal and glass, so they are durable to the weather and aren’t too complicated to change the artwork in. They are high up enough to avoid most vandalism, and have lighting only strong enough to draw attention to them in the laneway, keeping maintenance costs down. Graffiti artists are always finding new ways to present their art in public, whether it’s legal (like emerging projects such as Citylights), or illegal – like the sweeping craze of sticker art. Sticker art is cheaper than spray paint and quicker to place on a wall, rather than a large and complex mural-style masterpiece that can take days to complete. The stickers are made of paper with a print on them – typically white paper with black print – the cheapest print possible. The present trend is to use cartoon-style characters, part-whimsical, part-Japanese anime style. They can range from tiny stickers to large-scale (up to 1 metre or more), and are plastered onto any surface that will let them adhere – walls, ceilings, doors, fences, and even glass. The fact they can be stuck onto many more surfaces than spray paint opens up new ideas of composition and location of art for the graffiti artists. For instance, this example (Cnr Elizabeth St and Flinders Lane) is positioned so it feels as if the character is walking across the windowsill, giving it new depth and life that spray paint cannot achieve. Sticker art has also begun its rapid rise due to the lower charges if the artist is caught pasting on a sticker, rather than the much higher fines given out for painting on property. This is because stickers are temporary and can be removed easier than paint, which is so permanent it could last for months to years depending on the weather conditions of the area, and the quality of the spray paint. Graffiti is everywhere around us, whether we choose to notice it, or ignore it. It holds important messages and beautiful artwork, just like the professional design of billboards and shop fronts, although most of the public despise it as the majority of graffiti is deemed illegal. An art movement that is comprised of simple materials as spray paint, stickers, a free space and a little bravery, with the locations and colours being very important aspects of this often misunderstood movement.